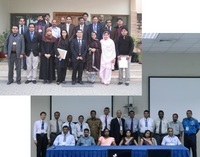 ADRC, TDLC, DMC Sri Lanka, NDMA Pakistan, and IRP jointly organized the training on disaster recovery planning for two SAARC member states. Over 40 high level government officials, who are engaged in long term post disaster recovery, participated in the event. It created a critical mass of government officials sensitized in concepts, principles, and tools of post disaster resilient recovery both at policy and field levels. The training was linked to other countries through video conferencing. It included lecture, discussion, reflection, simulation through scenario, and presentation of group recommendations at the plenary. Participants were encouraged to share their experiences and lessons with other countries for improved understanding and abilities in recovery. Comments for improving recovery plans were facilitated by IRP trainers with comments from ADRC Executive Director and other experts at different VC sites. Majority of the participants were decision-makers (Directors and Generals) indicating that the training attracted the interest of governments. It was clearly expressed that demand for training is at provincial and district levels. The use of case studies for training was highly appreciated by most participants, as it presented actual experiences. Suggestions to include more case studies from both Pakistan and Sri Lanka were strongly made.